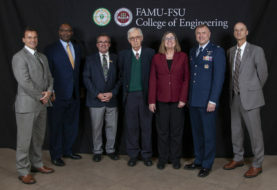 Florida A&M University (FAMU) President Larry Robinson, Ph.D. and Trustee Robert Woody were recently hosted by University of Florida (UF) President W. Kent Fuchs on UF’s main campus in Gainesville, Florida. They talked at length about ways the two historic land-grant Institutions can strengthen their collaborative efforts, especially in the area of agriculture and food science research. During President Robinson’s recent trip to Gainesville, he met with James Coats, CEO of Phalanx, a company that produces body armor, shields, holsters and armored vehicles. 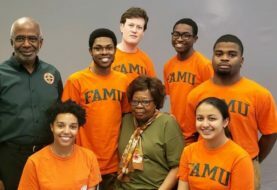 Phalanx is interested in working with FAMU to create new opportunities in the area of research, internships and jobs for FAMU students. President Robinson and Trustee Woody also met with Charles Perry Partners, Inc. and Parrish-McCall constructors to discuss opportunities for architecture and engineering students. The President also met with Gainesville and Alachua County leaders and University of Florida Leadership, including several FAMU leaders and FAMU’s 9th University President Dr. Fred Gainous, at the Gainesville Chamber of Commerce, the principal Curtis Peterson, staff and faculty of the Caring Sharing Charter School of Gainesville, and the FAMU NAA Alachua County Chapter. The national search for deans for the FAMU College of Pharmacy and Pharmaceutical Sciences and the School of Journalism & Graphic Communication has concluded. Johnnie L. Early II, Ph.D. will return to FAMU as the dean of the College of Pharmacy and Pharmaceutical Sciences. His appointment is effective October 22, 2018. Early comes to FAMU from the University of Toledo in Ohio where he has served in the same capacity as dean for an impressive 18 years. Dr. Early was previously at FAMU from 1978-1987. He first served as assistant professor and became dean in 1987 before leaving for Ohio. Michelle Ferrier Ph.D.’s appointment as dean of the FAMU School of Journalism and Graphic Communication is effective October 1. She is an award-winning columnist, author and associate professor at the E.W. Scripps School of Journalism at Ohio University where she was named one of the top 20 journalism innovation educators for 2018. She is also founder of TrollBusters.com. The Marching “100’s” drum majors recently discussed several historic milestones during a news conference. The marching band’s first female and Hispanic drum majors will make this year’s corps among the most diverse in the band’s 72-year history. Both new and returning drum majors shared their stories during a news conference in Lee Hall. Cori Bostic, a broadcast journalism major and honors student from Atlanta, Georgia is the band’s first female drum major. This is the second year that Aaron Torres, a recent political science graduate now working on his master’s degree in applied social science will join the corps. The College of Law’s Interim Dean Leroy Pernell will be honored for his successful career and contributions to the legal community. He has been selected as a “National HBCU Pre-Law Hall of Fame Honoree” for 2018 and will be honored in September in Atlanta. Associate Professor of Pharmacology, Syreeta Tilghman, Ph.D. will receive a National Institutes of Health research grant for a total of $1.46 million over the next four years. Her research is related to breast cancer. School of Business and Industry Professor Roscoe Hightower will serve as an advisor to the International Facility Management Association Foundation’s Board of Trustees. Next article FAMU Announces Inauguration of 12th President, Larry Robinson, Ph.D.